Description: Small black long rectangular engine with 4 round molded circles on top (measures 2" long, 3/4" wide, 3/4" tall). 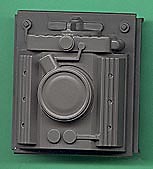 Description: Large light dark grey squared engine with a round air cleaner and other molded gadgets on top (measures 2" long, 1-7/8" wide, 3/4" tall). Description: Small dark grey long rectangular engine with 4 round molded circles on top (measures 2" long, 3/4" wide, 3/4" tall). Description: Small silver long rectangular engine with 4 round molded circles on top (measures 2" long, 3/4" wide, 3/4" tall).